While most of the reefs we have surveyed in the Great Barrier Reef have an emergent reef flat, one of the northern reefs we were studying was fully submerged and quite difficult to locate. After circling around our GPS coordinates for more than an hour, we located a slightly elevated ridge that extended from the seafloor to 19 m depth, and decided to check it out. Upon reaching the bottom, we realized we were in the middle of a deep sand flat, in very high currents. Even though there was no well-developed coral reef, the bottom was full of life. There were tufts of seaweed, small rocks, sea fans and soft corals, sea pens, tunicates, and the occasional coral. The corals found here were different from what we usually saw – they were all free living. This makes sense, since there was nowhere for them to attach, and the sand was constantly shifting with the currents. 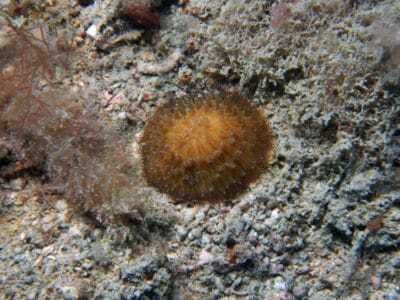 A free-living mushroom coral, Fungia. There are several free living corals that are quite common, even in true reef environments. Among these are the mushroom corals (Fungia), most of which are very large solitary (single-polyp) corals. These settle from the plankton, attach to a rock, and develop a short stalk which eventually breaks off once they become too heavy. At this point, they will live in the sand, on rubble, and on the reef where they are at the mercy of waves and currents. They are often flipped over by water motion. Fortunately, they can fill their tissues with water and blow up (like a water balloon). By expanding parts of their soft body and deflating other parts in the right sequence, aided by the use of muscles, they can move slowly across the bottom and flip back over when inverted. A small colony of Trachyphyllia. Another brightly colorful free-living coral, highly prized by aquarium hobbyists, is Trachyphyllia, the open brain coral. These are also found in sandy areas, but their concave shape helps keep them upright. They resemble an inverted cone and will be found partially buried in the sediment. There are two other free-living corals that we found on this dive, Heterocyathus and Heteropsammia. 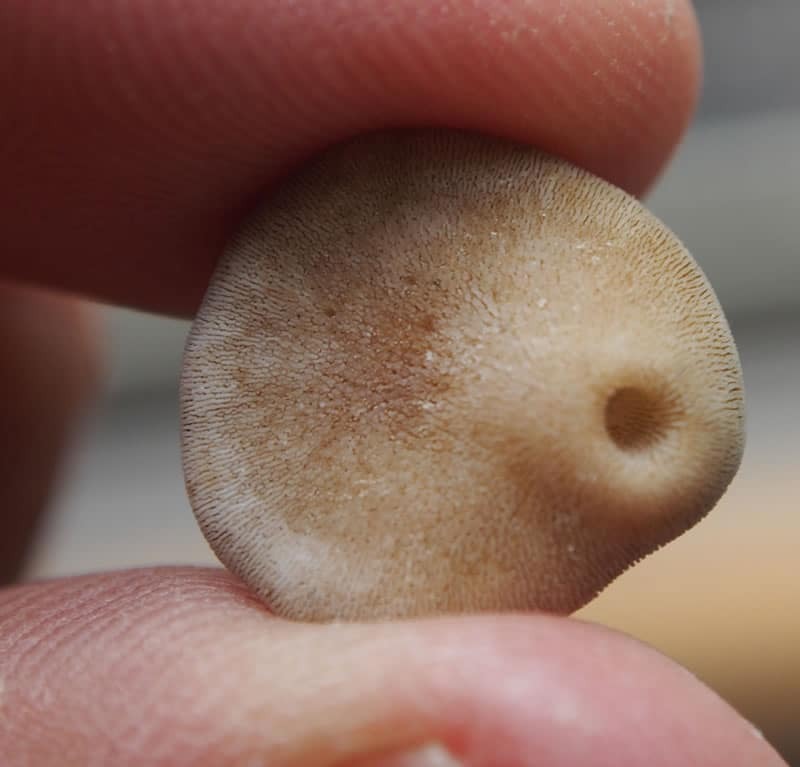 Both are much smaller than most fungiid corals and Trachyphyllia, achieving at most the size of your thumbnail. They resemble Dendrophyllia and Balanophyllia, which are also solitary corals, although both of these are found attached to a hard substrate under overhangs, in caves, and other dark places, and unlike their free-living cousins, they lack zooxanthellae (symbiotic algae). Walking corals (top left) are much smaller than most mushroom corals (bottom right). 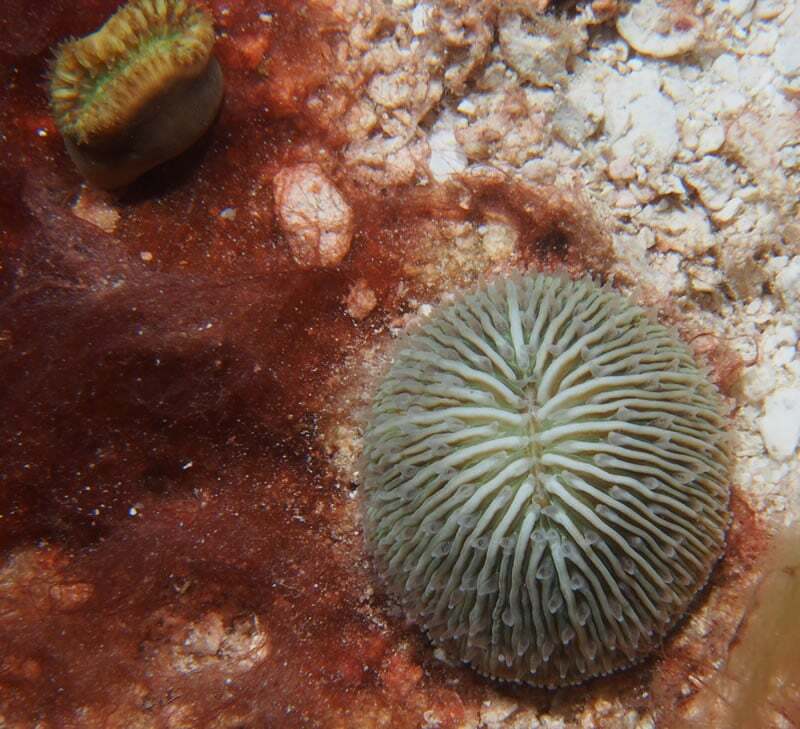 The free-living Heterocyathus and Heteropsammia corals include two species that are commonly called walking corals. These corals are able to move across the sand at lightning speed (for a coral, anyways), covering a few meters of territory in a day. A walking coral with expanded tentacles in the middle of a mat of cyanobacteria. Like other corals, walking corals have a planktonic larvae. The coral larva settles on an abandoned gastropod shell that is inhabited by a tiny tube-dwelling sipunculid worm. 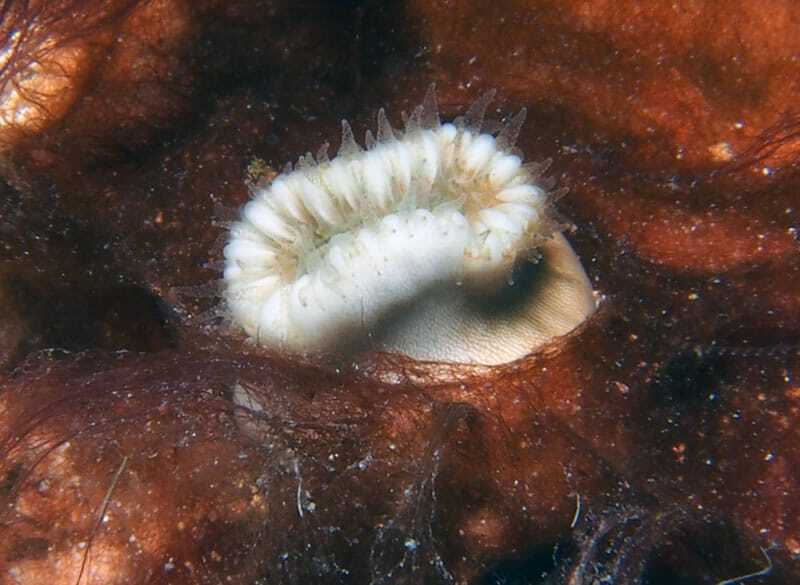 The coral eventually grows over the gastropod shell, leaving a small hole on the bottom that serves as the opening for the worm’s tube. The worm maintains and continually expands its tube, keeping up with the growing coral. A close-up of the underside, showing the hole inhabited by a sipunculid worm. 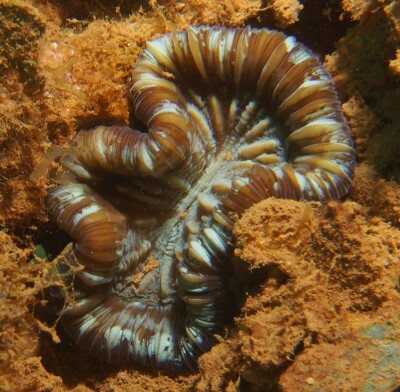 The coral and the worm have a mutually beneficial relationship. The coral is transported to suitable habitats, prevented from being buried by sand, and righted if it is turned over. The worm is provided with shelter that lasts its lifetime. Previously reported only from Bali, we believe our surveys represent an expanded distribution of these unusual corals. 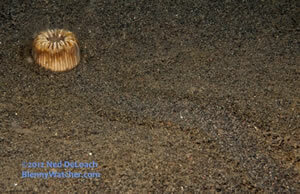 Find out more about walking corals on The BlennyWatcher Blog.